(Beauty Hula MM16) Staying motivated to exercise is easy with a MUVE dance along because everyone adjusts the intensity of movement to their own liking. The easy workout routines on the Mellow MUVE DVD, for which this dance was originally created are specifically intended for people who love music and dance and prefer gentle exercising at home. Mellow MUVE is a joyful way to exercise with free easy dance steps that are just your size. Out of shape? Overweight? - No problem, try our low impact workout video right now! (Local Motion Style) MUVE dance along workout videos online bring low impact cardio exercises right into your living room. Get motivated to exercise by dancing along to our gentle movements created spontaneously by MUSE Maggie. In our easy free video workout everyone listens to their own body and chooses the size and intensity of any dance move. (Pi'i Mai Kanalu) MUVE can help you get up and moving at home, either with a DVD or with our free video workouts online like this You Tube video right here. It's high definition and you can run it full screen. All it takes is for you to get up and move with us to the music. We move spontaneously, enjoying every beat of the music with our body. No specific goal needs to be reached. Everyone moves to their own delight in MUVE. That means that while you are exploring the ideas you see on screen you can shape the movement to your own needs. If you want a more intense workout, you can put more energy into your moves. And likewise you can always make your movements smaller or slower. That's the beauty of MUVE, and one of the reasons all generations can dance together with MUVE. So go ahead and invite your family to join in! Chairs make excellent toys and dance partners. In addition they provide security! If you have issues with balance and are afraid of falling, add a chair in front of you, for any MUVE dance-along. You can also at any time sit down on it to get a rest. Continue moving along while sitting; as always the video provides ideas, but you are the one customizing each movement for your own body. 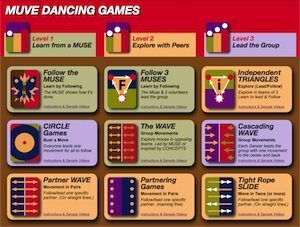 In this Follow the Muse Dance Game, Maggie in the center position is the Muse and lead dancer. Her fellow dancers follow loosely. There is no need to be precise. MUVE dancing is about having fun and exploring creative dance moves. When you follow someone else you are likely to discover new moves that your body and mind enjoy. Go ahead and dance along to this video right now.